Sometimes I have to spend the weekend doing normal things, or doing better-than-average things in a dimly lit or crowded environment. 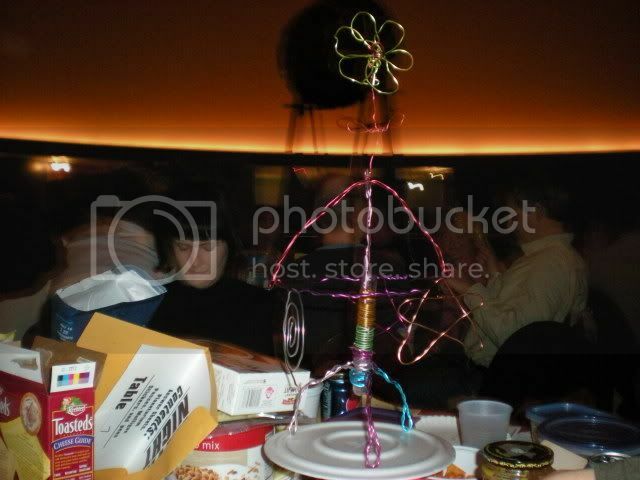 This weekend we went to trivia night at the St Louis Science Center. If you're in St Louis, you probably know all about trivia nights, but what you may not know is that this popular weekend fund raiser is as "St Louis" as toasted raviolis and provel cheese. They are so common here it's hard to believe that many other cities have never even heard of such a thing. An explanation for those outside the area: Trivia Night is similar to what you may know as pub trivia, which we also have, but the ones we have on the weekend are 10 rounds of 10 trivia questions, held to raise money for a charity or sports team, usually held in a school gym, church basement, or community center, and cost $10-35. The $10 range is BYOB but probably includes some snacks and soda. At the $35 level we generally expect catered dinner and free beer/wine (check out the Young Friends of the St Louis Zoo "Trivia Gone Wild" the first weekend of May for this high end trivia night). At most of them you also bring snacks to share, and you will see everything from a table stacked with White Castles Crave Cases to an extension cord running to the wall for someone's Crock Pot. The food is almost as important as the competition. Trivia night is our winter sport, because we are usually busy with amazing adventures in the summer, but if you are dedicated you can do them year-round with the assistance of TriviaNights.net. The Science Center Trivia is in the Planetarium, and makes use of all the multimedia available, including the star projector. 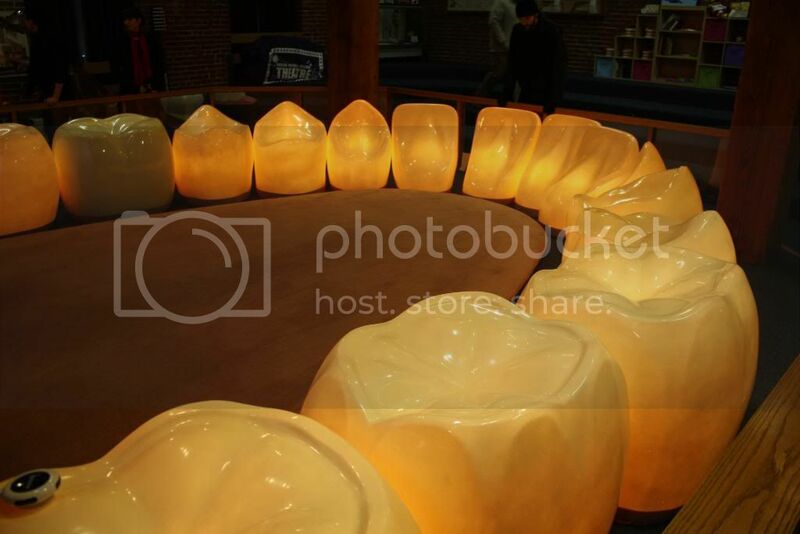 Awesome, but not conducive to a photo spread. 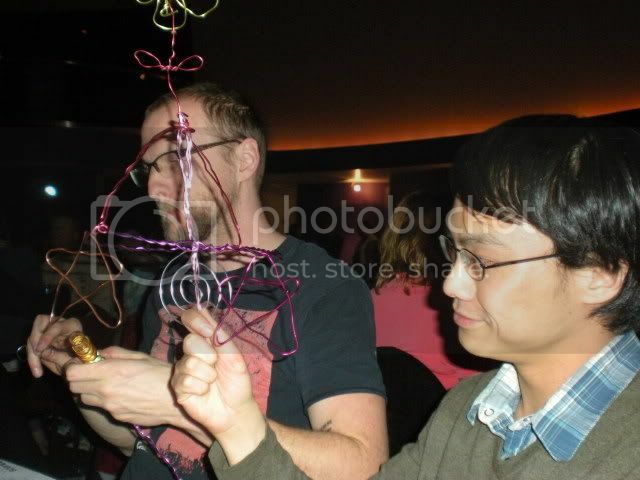 The pictures are what happens when a table full of nerds is given a fish bowl full of curly wires as a centerpiece. Tables all over the place had spontaneous sculptures, hats, and hair ornaments. Whew, sorry it took me so long to post this week. Daylight Savings Time gives me jetlag and it took me awhile to find my blogging muse today. 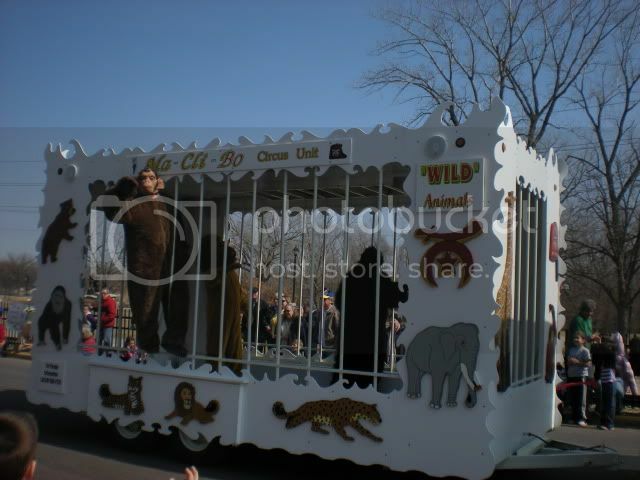 The parade was last weekend in St Charles, and the Circus starts Thursday the 18th at the Family Arena and runs through Sunday. 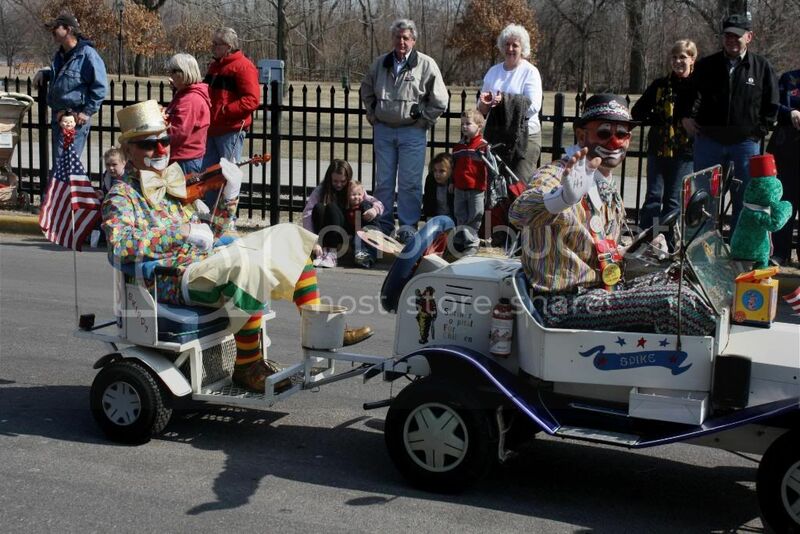 For my clown-phobic friends, the clowns will be at the end, and you will have a warning two pictures in advance. I don't understand you, but I respect you. 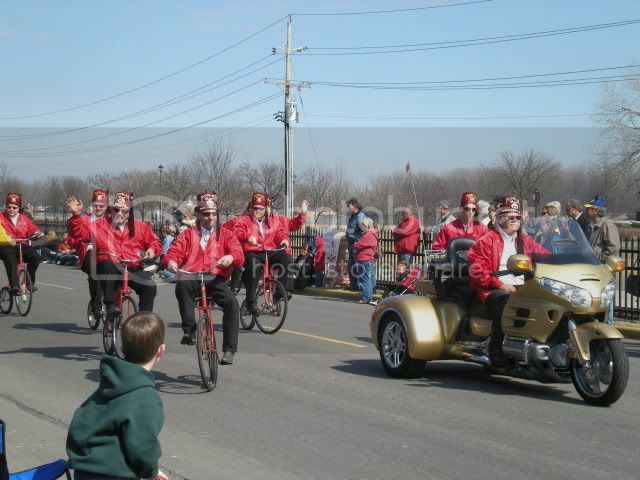 A lot of people have asked me exactly what the Shriners are and what they do. 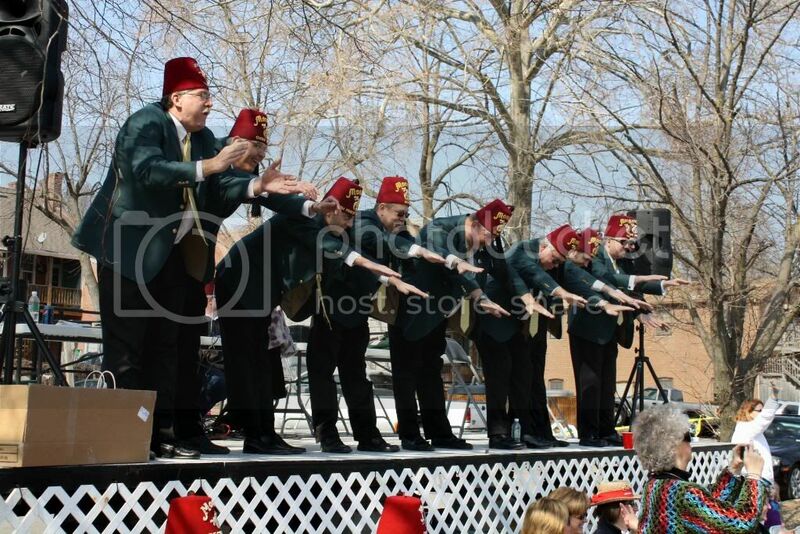 I am not affiliated in the Shriners in any way, but I think I can tell you a little bit as a layperson (if that's the right word). 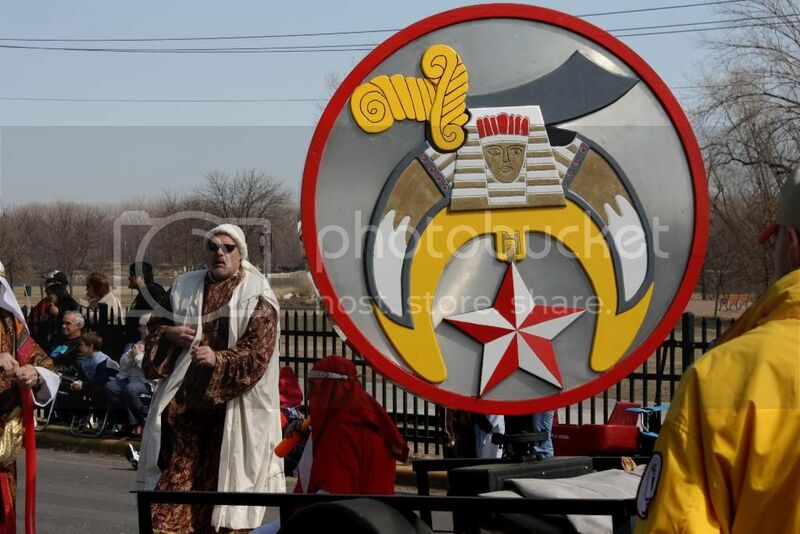 First of all, to be a Shriner, you have to be a Master Mason in Freemasonry. 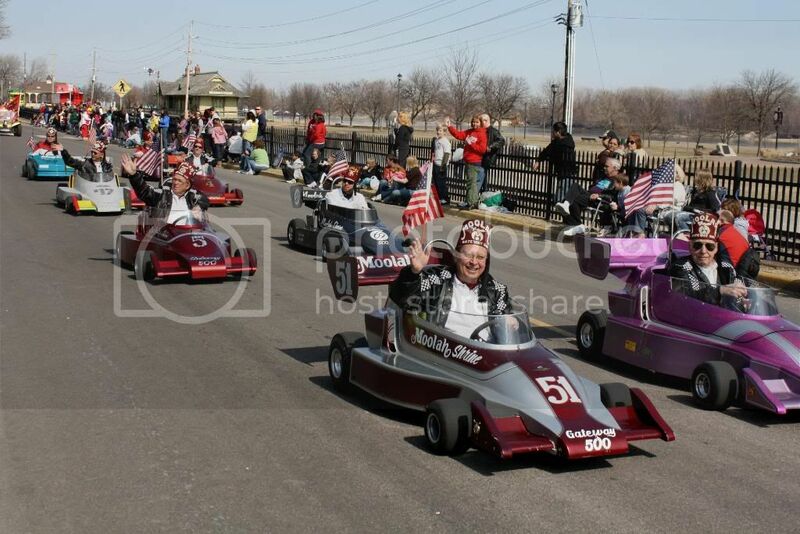 Shriners International is divided into different regional groups, or temples. 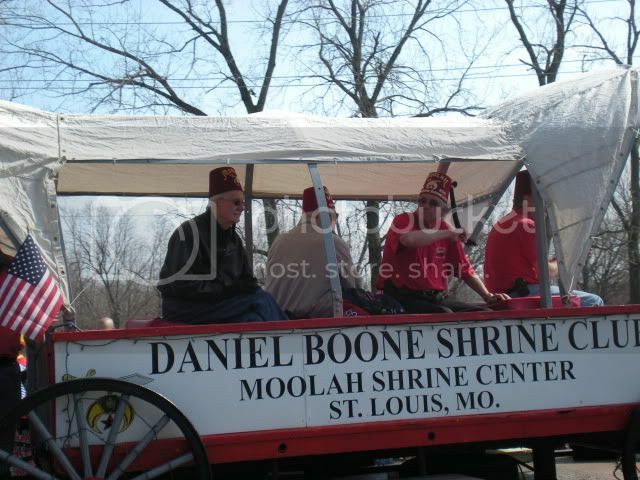 The one familiar to St Louis is the Moolah Shrine, but across the river in East St Louis we also have the Ainad Shrine. 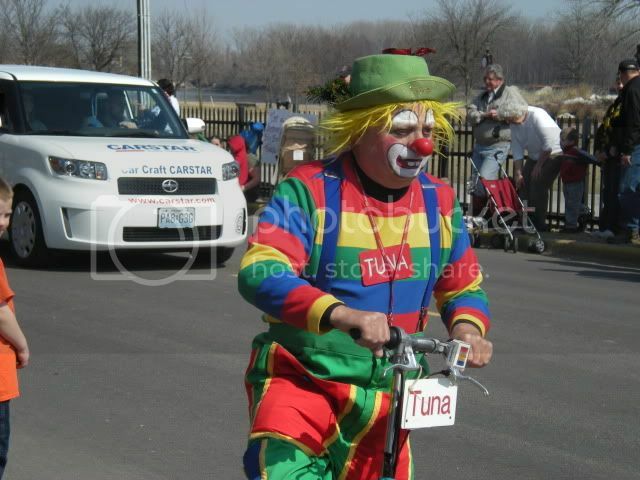 Ainad also took part in this parade. This dog is not from Aidad. He is from C.H.A.M.P. 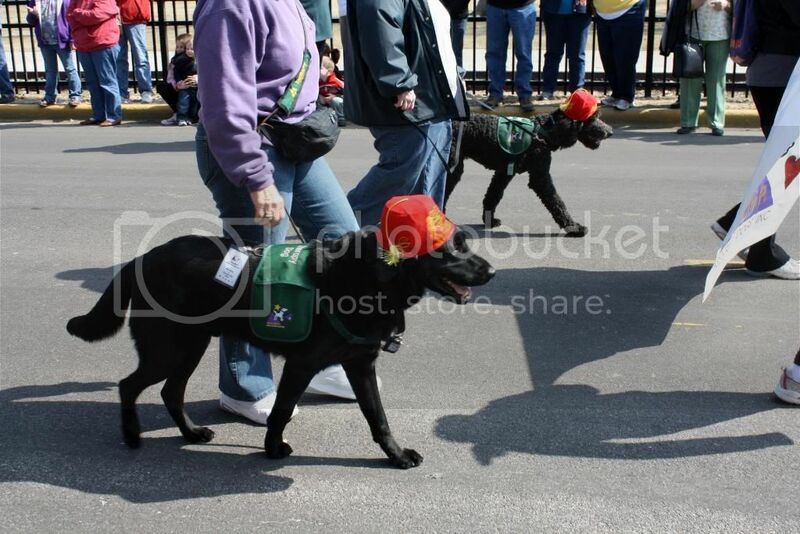 Assistance Dogs. 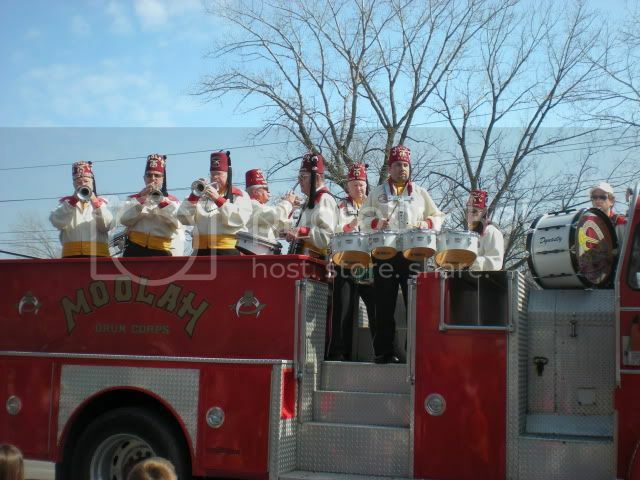 If you have been a long-time reader of this blog, you may remember my Shriner Parade post from a couple years ago. 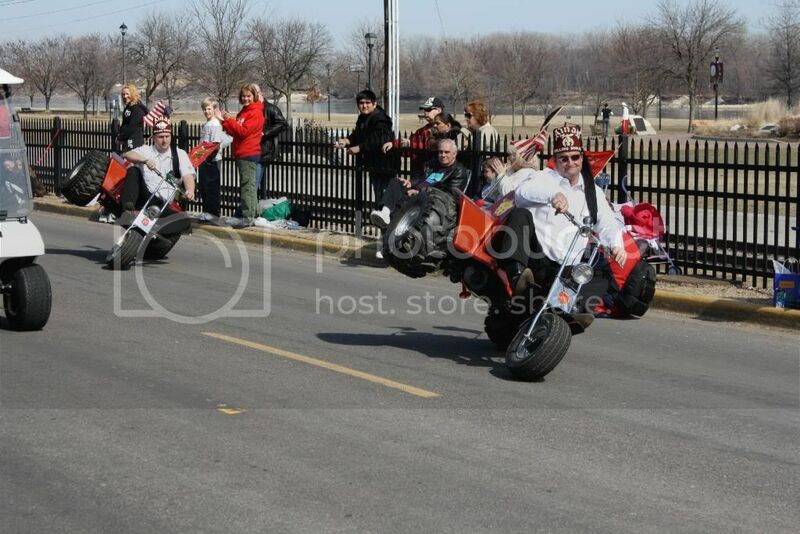 That was the Imperial Parade, when Shriners from all over the country were in town for their annual meeting. 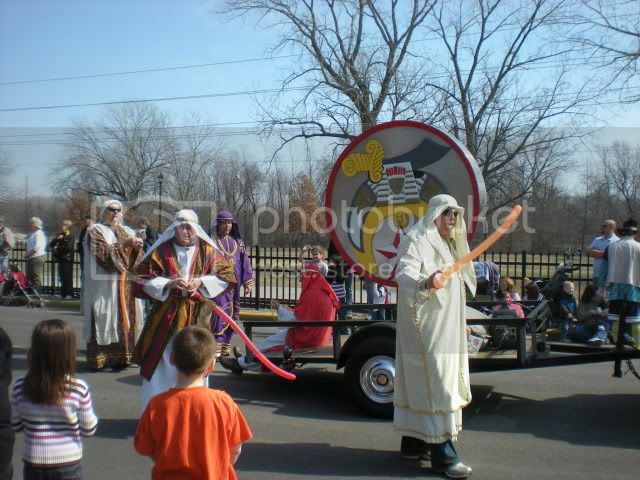 Why they seem to revolve around an Arab theme, I cannot tell you. Let's just leave that alone as part of the mystique of Freemasonry. 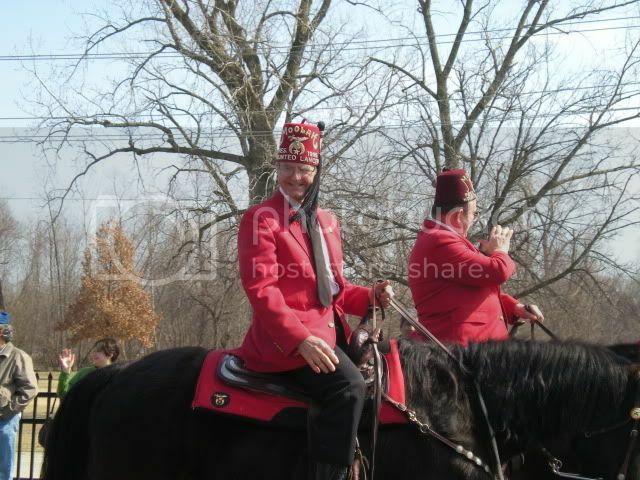 But just as an aside, BACK IN MY DAY the Ceremonial Committee carried around scimitars instead of balloons. 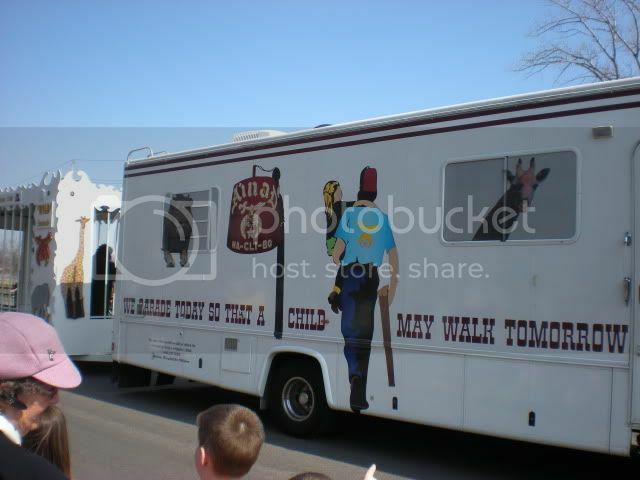 The Shriners primary mission is the Shriners Hospitals for Children. Much of the money they raise goes to fund these hospitals, which provide care for children with orthopedic conditions, spinal cord injuries, burns, and cleft lip or palate with no financial obligation to patient or family. 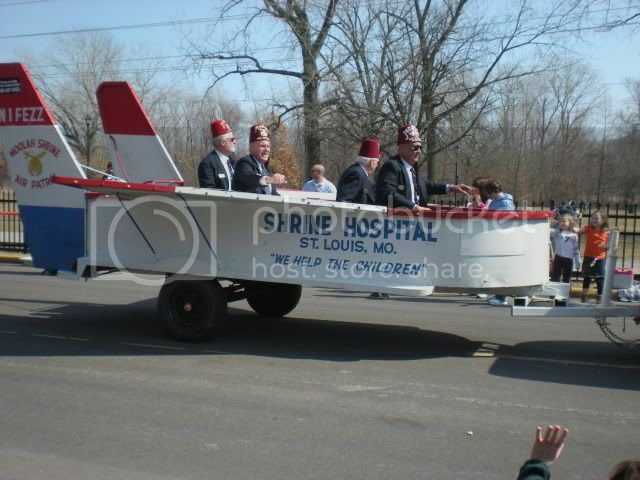 I have heard some criticism over the years about how the Shriners spend their money. I suspect some people are a little confused by the difference between a charity and a fraternal organization that does charitable work. 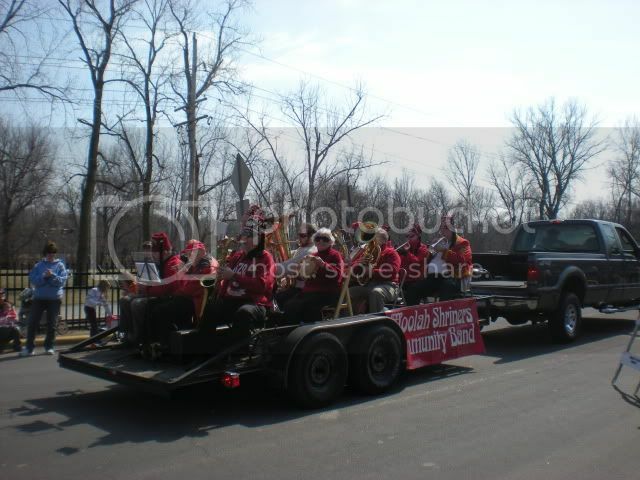 As I said, I am not affiliated with the Shriners, but I do know some people who had surgeries at Shriners Hospitals when they were kids, and I think they provide a valuable service to the community, whether it is spinal surgery or Yomo cars. Surely you remember how dangerously exciting Yomo cars were when you were a kid. If Yomo cars and mini Indy's attract attention to their cause and allow them to provide medical care with no financial obligation to the families, how are you going to nitpick their finances? 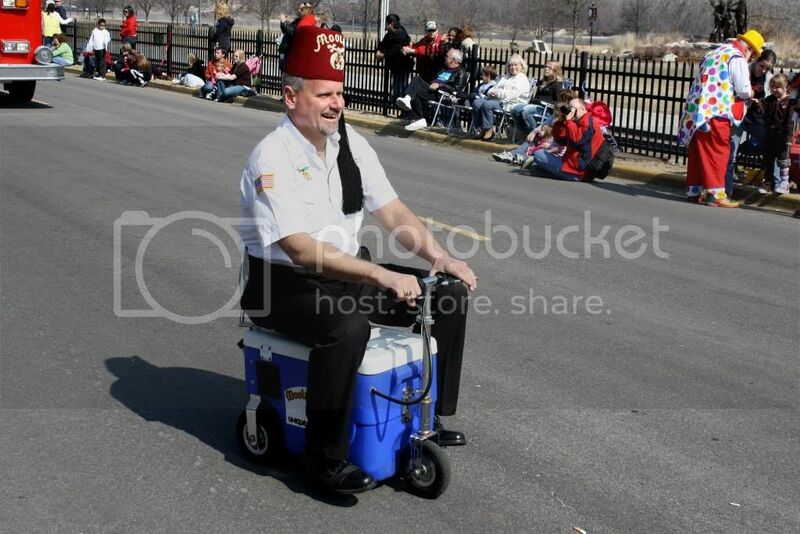 OK, enough of my Shriner soapbox. 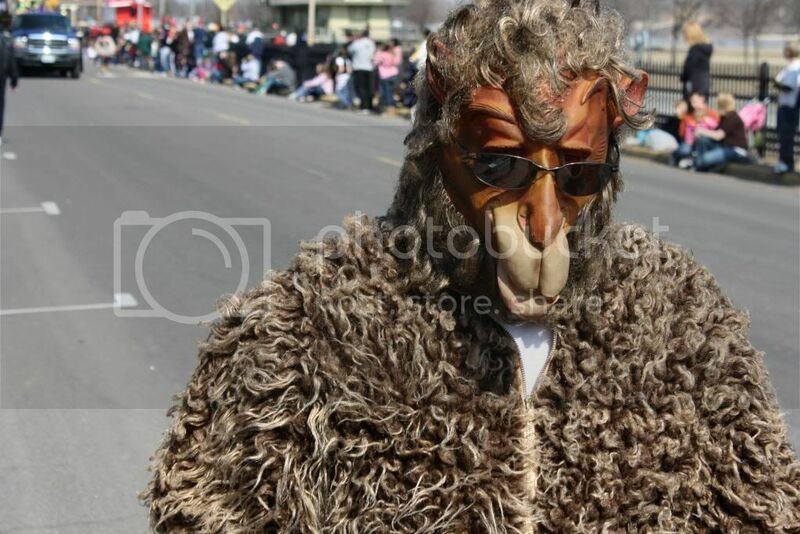 Enjoy some more pictures. TWO PICTURE WARNING! 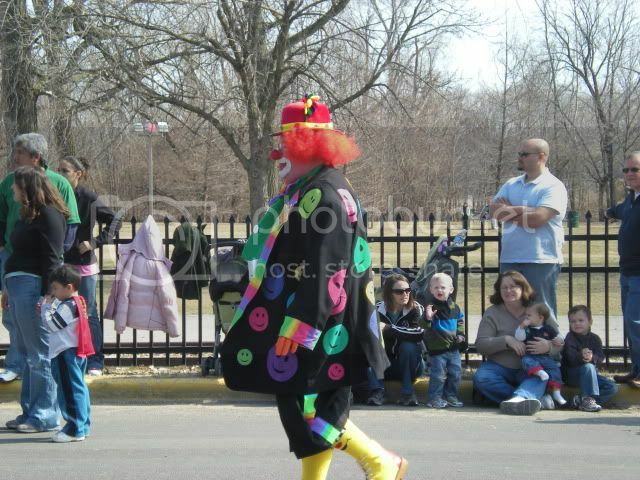 COULROPHOBICS, PREPARE TO EXIT! 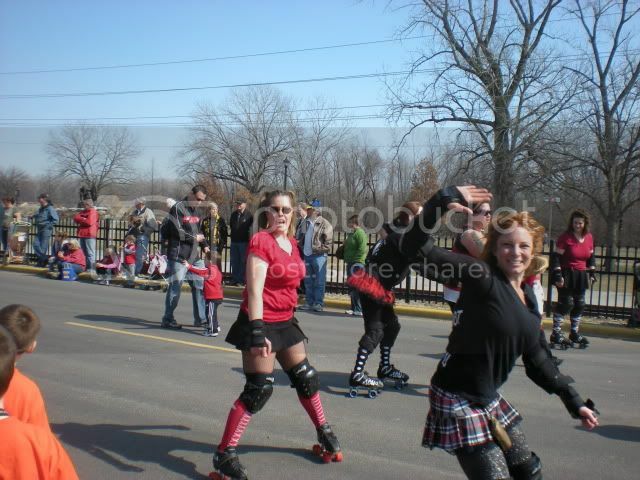 Say hi to the St Chux Derby Chix! 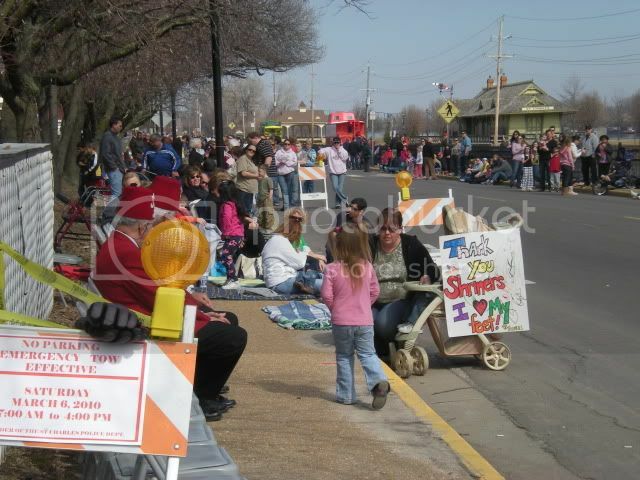 Another year or so and they will be ready to get the pants beaten off of them by the Arch Rival Roller Girls. HA! 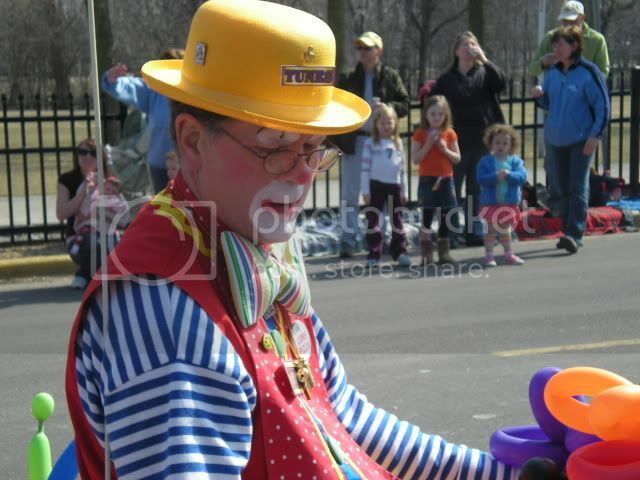 OK, SEND IN THE CLOWNS! 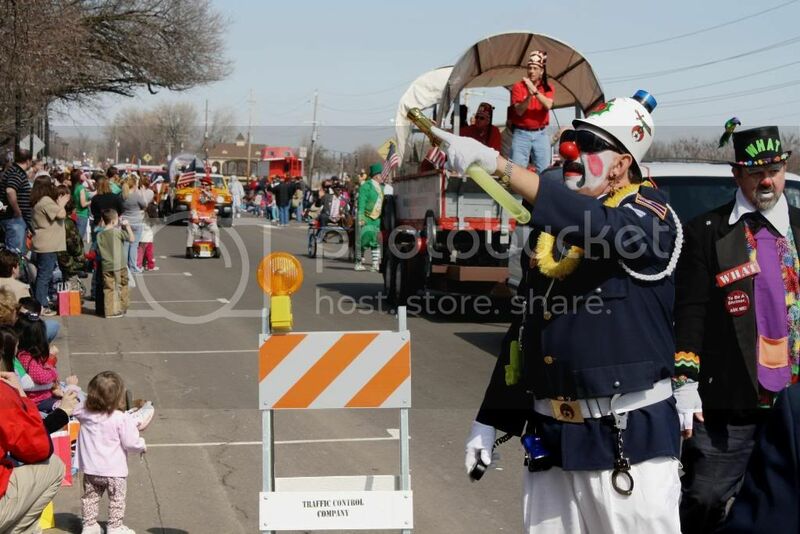 I don't understand the phobia because I LOVE clowns. I couldn't leave them out just because some people are irrational. That's all, folks! 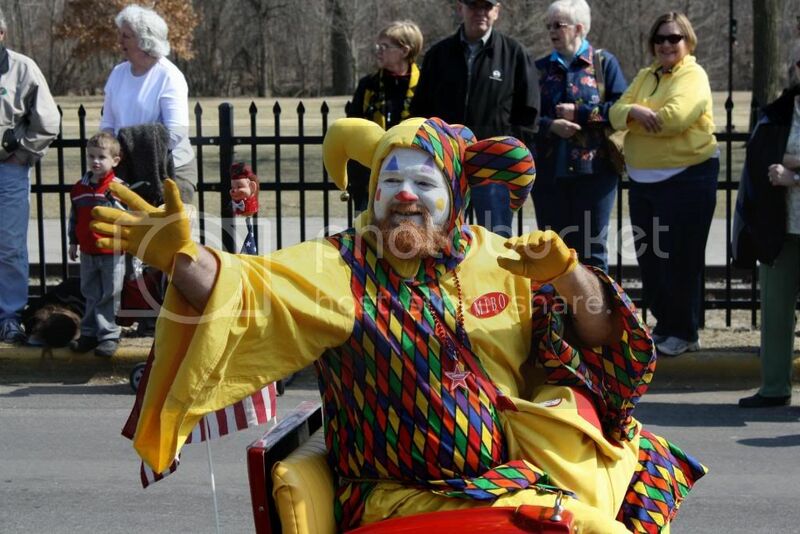 All the information on show times and tickets for the Moolah Shrine Circus can be found at stlshrinecircus.com. It has been awhile since I did an Obscure Monuments and Memorials entry. 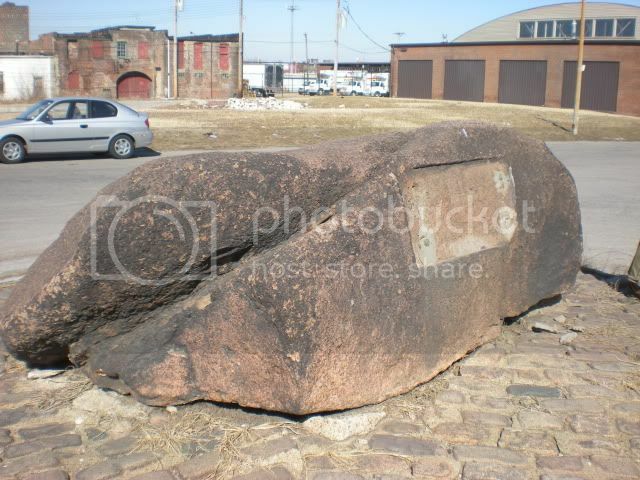 Back in November, my friend Sara asked me to find out more about this big rock in the area of Produce Row in downtown St Louis. She showed me the Google satellite map and I thought I knew exactly where it was, but I found out when I got down there that a lot of street signs in that area are missing. I got turned around and never did find it. Fast forward to yesterday when Keith, Courtney, Robbie, and I were heading to St Charles for the Moolah Shrine Circus Parade. A section of highway 70 is closed for repairs, and we had to detour. 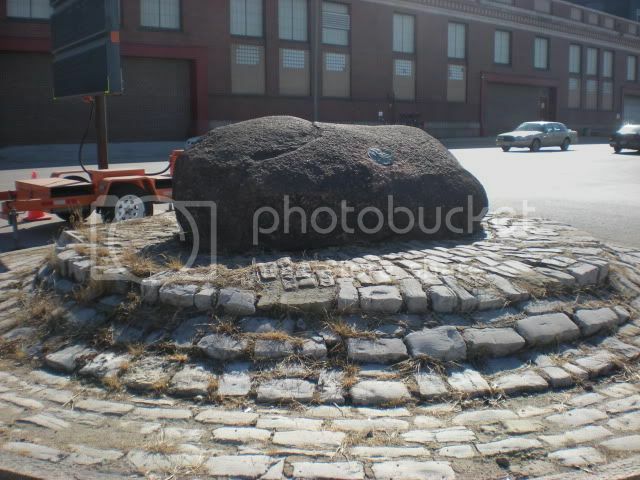 As we are driving down North Broadway, I am telling them the story about how I tried to find this big rock on Produce Row, and Keith says, "You mean that big rock?" Holy cow, it was THAT big rock! So we flipped a u-ey and took some pictures. As it turns out, Sara found out more about it and I've done a little "digging" myself this afternoon. The big rock marks the site of the Big Mound, which was the largest Native American mound in the St Louis area. As the city spread north, the mounds were leveled. Big Mound was carted off by the wagonload, to be used as fill dirt in other areas, or to make bricks from the clay. CC&G mobile in the background. Can you believe most weekends we cram 4 adults in that car? The sad thing is, there was once a plaque on this big rock, letting people know, well, why it is there. 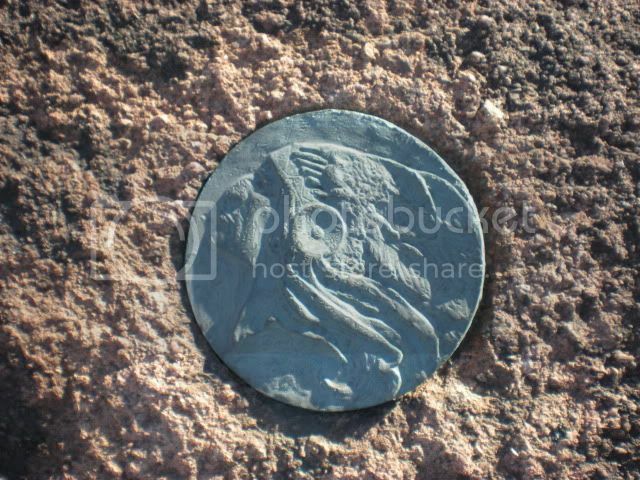 I'm sure it was made of a valuable metal and pried off - you can see evidence that similar attempt was made on the medallion on the other side. I'm sure very few people stop to see what that big rock is, but still, the missing plaque is shameful. This was all the more apparent to us yesterday since we were surrounded by cars with out of state plates who were forced to detour through a neighborhood that looks like a bombed out wasteland. I hope the Missouri History Museum can find a way to restore this monument in some way. If there is some kind of fund, or a problem that needs solving, let me know and I will post about it here. Here is the satellite view if you want to check it out for yourself, maybe do some weeding while you are down there. Further reading: An interesting article from the St Louis Post-Dispatch from a couple weeks ago about many of the things that have been found in the archeological dig going on at the sites to be used for the new Mississippi River bridge. 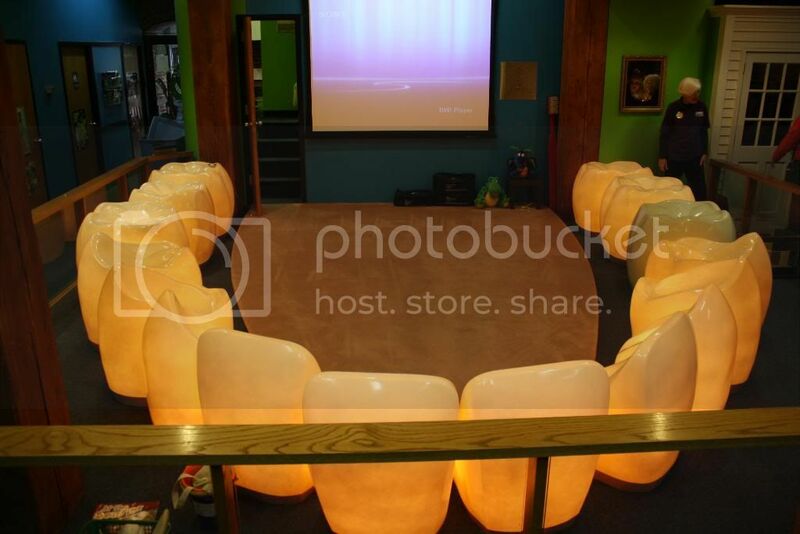 Did you know the World's Largest Set of Teeth is right here in St Louis? 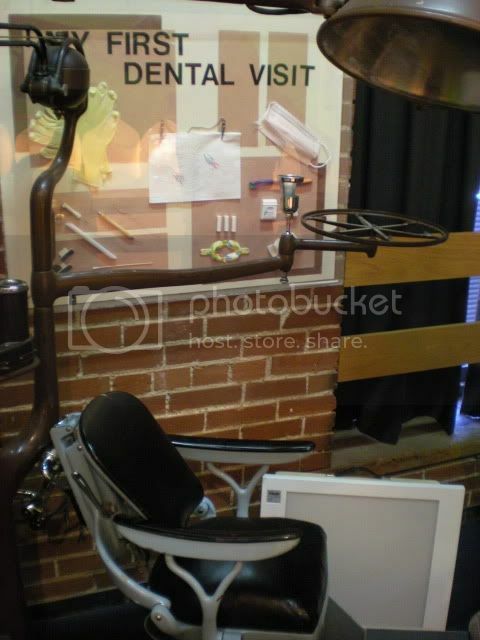 I have covered some lesser known treasures in this blog, but the Delta Dental Health Theater is one of the REALLY hidden gems. You probably didn't even know that it was there, right in the same building as the Old Spaghetti Factory, or if you did, you probably haven't been since you were about 5 years old. It has been a popular field trip spot for more than 25 years! I think Mary was a little surprised to have six adults show up for the 11am show on Saturday. Since we were the only ones that day, and we made it to adulthood with most of our teeth, we got a more casual presentation. 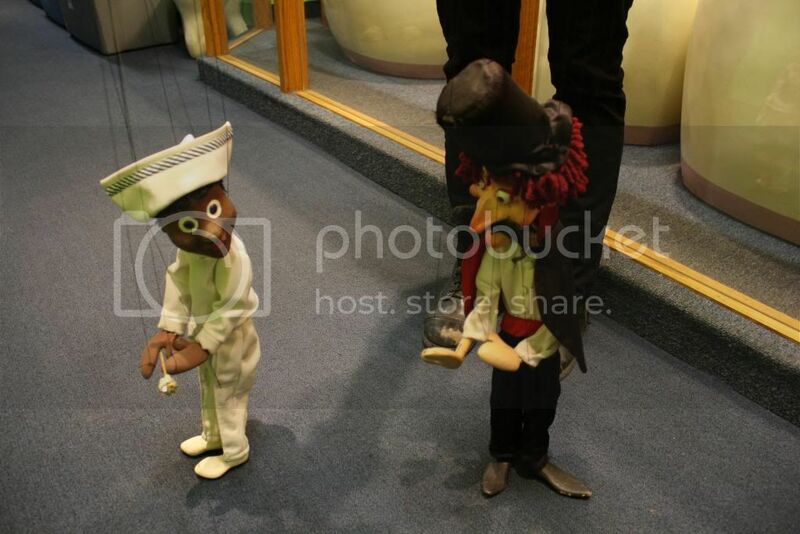 We also got to see some old treasures that you won't see these days, like these marionettes from back in the day. 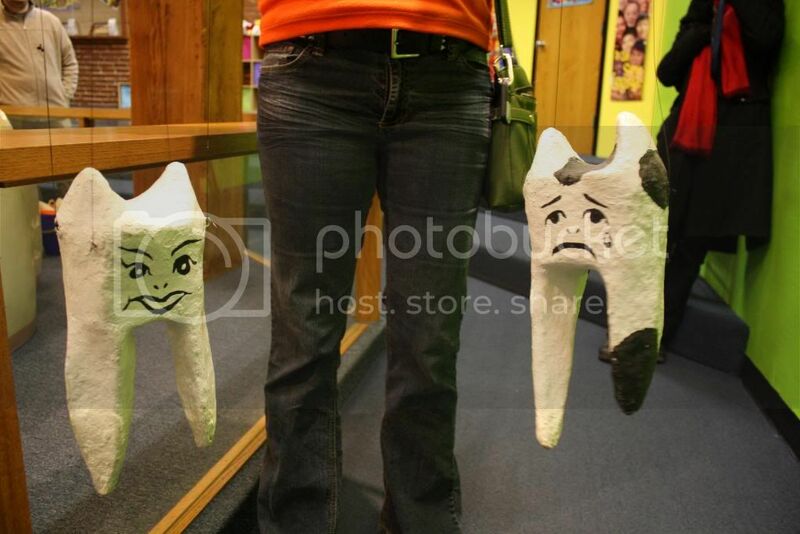 Below are Tooth Fairy and Mr Tooth Decay. Maybe you remember them? 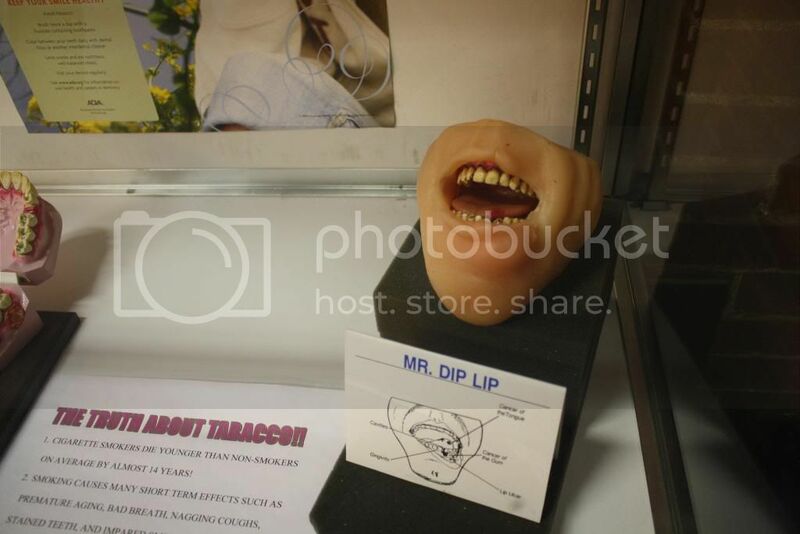 If you bring kids, you will learn about healthy eating habits, proper brushing techniques, and the evils of smoking and chewing tobacco. 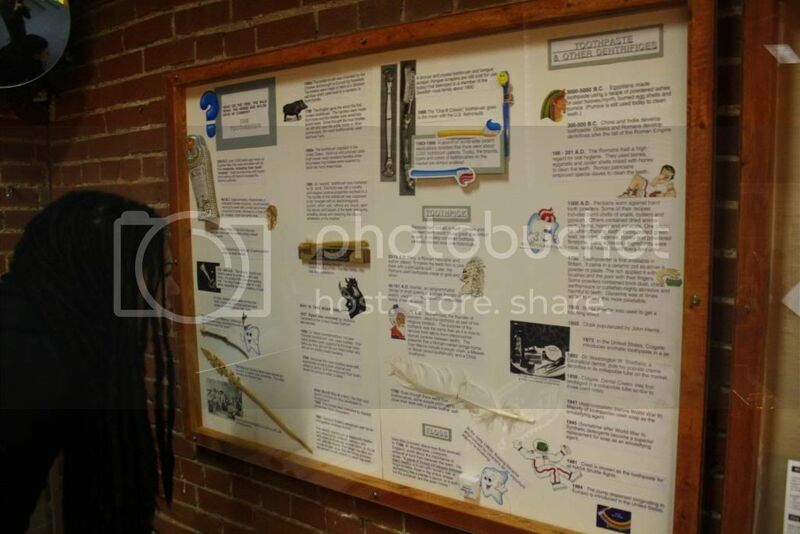 There is also a big board full of all kinds of interesting trivia about the history of toothbrushes and toothpicks! We insisted on watching the full DVD in the theater, wherein Sir Smiles A Lot sends you on various missions with the Tooth Wizard and P.A.N.D.A. (which stands for Prevent Abuse and Neglect through Dental Awareness). 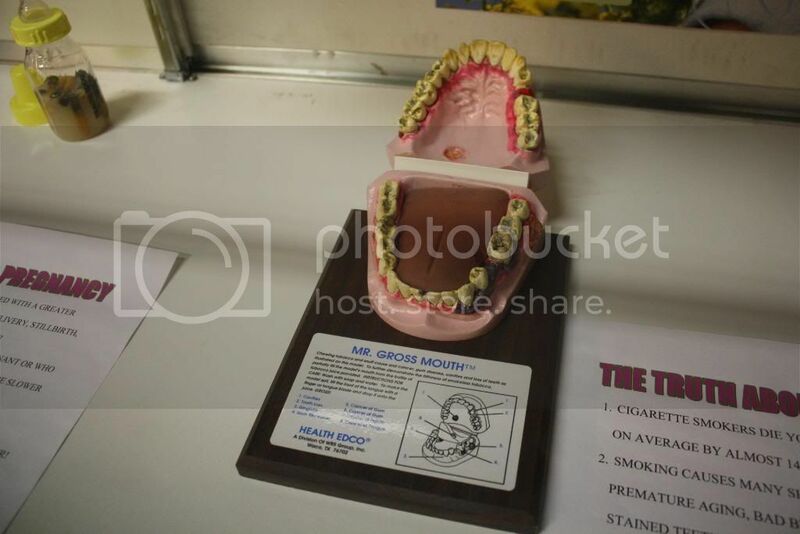 I have to say, the Tooth Wizard had me pretty convinced that the dentist is a fun and exciting place to visit. The best part is that this costs $1. ONE DOLLAR. Obviously, they are not raking in the money hand over fist here, so they depend on support from the community. Tell your dentist, tell your friends, stop by and pick up a Schnucks eScrip Community Card. They also do Birthday, New Tooth, and Lost Tooth parties! Their regular hours are Tuesday through Saturday, with show times at 9:30am, 11am, and 1:30pm. You will find the phone number and email address for reservations on their website (linked at the beginning of this blog).